We love our new kitchen! The backsplash, the cabinet doors, cabinet/drawer pull outs, lights, paint and countertops are so nice! You did a great job and we are very pleased. Please feel free to use us as a reference and know that you’ll get a good one. P.S. We love our cabinets. When refacing looks like this, why would anybody replace. No one could ever tell the difference. They look brand new. Having owned multiple rental properties for the past 20 years, I have worked with many trades people. Ed Rouldes and his team are far and above everyone I’ve ever worked with. Ed calls when he says he’s going to call. He shows up when he says he’s going to show up. He is always on budget and has actually talked me out of spending more money. Ed provided exceptional quality craftsmanship, excellent communication and professional integrity. Ed Roualdes recently did a kitchen refacing for us. We found Ed through his excellent Yelp and Houzz reviews and when we first met with him, we knew instantly we’d found a fantastic guy. Not only is he a genuinely great person, honest and trustworthy, but his workmanship and attention to detail is beautiful. 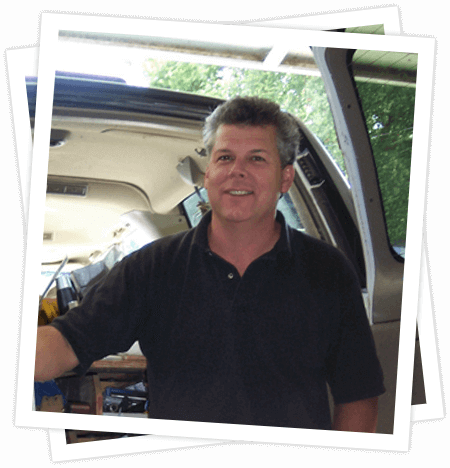 Ed consistently went above and beyond, often acting as a General Contractor for our project. With Ed in charge the only thing we had to worry about was choosing our finishings! His pricing is totally reasonable; he was a fraction of the cost of Home Depot, and has so much more to offer in terms of product options and expertise. The project also moved along very efficiently which we really appreciated, as a kitchen remodel can be fairly disruptive. We couldn’t have asked for a better experience than with Ed and would highly recommend him for any job! Our new cabinets are just perfect. It makes the whole bathroom look updated and pulled together. Plus your workmanship is A-1. You would never know they are refaced instead of new. Thank you thank you for a wonderful and beautiful new kitchen. I am so happy and so pleased with your perfect workmanship and wonder why I didn’t do this project a long time ago. Thanks for everything including the paint discount, paint equipment and painting tips. Ed did the remodel for our kitchen. He listened to what we wanted, gave us a lot of ideas, and gave us a kitchen that was beyond our expectations. He also acted as mediator to make sure that both my husband and I got what we wanted. It was a very smooth process. He gave us a quote on the cost, stayed within our budget, and finished on time. We still walk into our kitchen and say “wow”. The entire experience was awesome. Thank you Ed! I love my kitchen. Ed did such a good job. My friend, Liz, is also very pleased with the remodel of her kitchen. I love my cabinets! Ed did such a great job. I know the project was long and painful but the outcome was amazing. 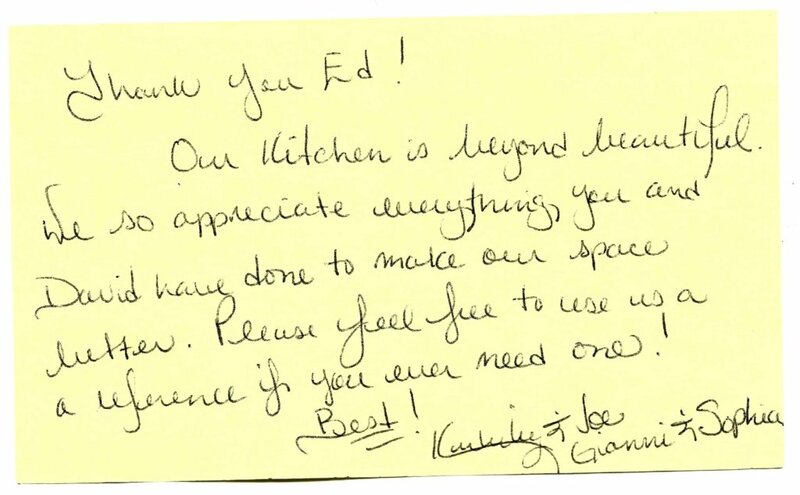 Everything was great and I am very happy with my new and improved kitchen, Ed and Dave did a wonderful job, and I especially appreciated Ed’s excellent ideas and suggestions. He and Dave did many helpful things that I didn’t expect, like removing the contents of the old drawers and then putting everything back into the new ones. There were other ways in which they went “above and beyond,” and I was very impressed by how willing they were to add those extras that made the whole experience easier and more convenient for me. But most important, they did really great work and hugely improved my kitchen, both aesthetically and practically. I can’t think of anything they could have done better. Dan and I wanted to let you know how pleased we are with the work you did to make our kitchen beautiful! We are just about through putting everything in its place, including the fan cover which came out great. It is so pleasant to walk into the kitchen now. It has a wonderful feel to it! It is a pleasure to cook, wash dishes in the new sink, and even to throw garbage away! It is fun to look at the before and after photos too—what a big difference! We appreciate the great suggestions you had, the care you took with the project, and the craftsmanship you put into your work. Thank you! We had quite a few projects done to our home last year – new windows, new floors, new landscaping, etc, etc. Everyone we worked with were what I considered good to excellent. But I have to say Ed Roualdes was a step above all when we re did our kitchen. Ed did an excellent job and he knows his craft backwards and forwards. But what impressed me most was his attitude and professionalism. Ed’s quote was accurate, his was on time always, would stop his work to speak with me, kind to my two toddler kids, offered advice and solutions that went above, and beyond the job was overall pleasant. I highly recommend Ed for your kitchen project. Ed is amazing to work with…we would highly recommend him to anyone and everyone! Recently he did a kitchen remodel for us and we could not be more pleased! He was able to remove a wall and open the kitchen up to our living area… instead of replacing all of our old cabinets Ed was able to completely reface them! It’s as if they are brand new… gorgeous! Ed had wonderful references when it came to where to choose our beautiful countertops, what brand to order for kitchen appliances etc., which made our lives easy! Any question we had he had no hesitation to answer… he definitely knows what’s he’s doing!! I was worried with two young kids that it might be hard to do this remodel… Ed changed that for me… sometimes I forgot he was even in the house he was so quiet and polite! You won’t be disappointed! Thanks Ed for our beautiful kitchen!! I wish to show my appreciation for my beautiful new kitchen. Martha did a nice cabinet design and you did a wonderful job in getting it in place. Your insight and input helped me to make this possible. I would be happy to talk to any of your potential customers. We are thankful for the great work you did on our kitchen. You truly made an awful situation for us into a positive experience. You really went over and above the call of duty and we are very grateful. P.S. Everyone that sees our kitchen just loves it! We felt very comfortable with Ed and his partner David being in our home working on our kitchen when we were away on vacation. 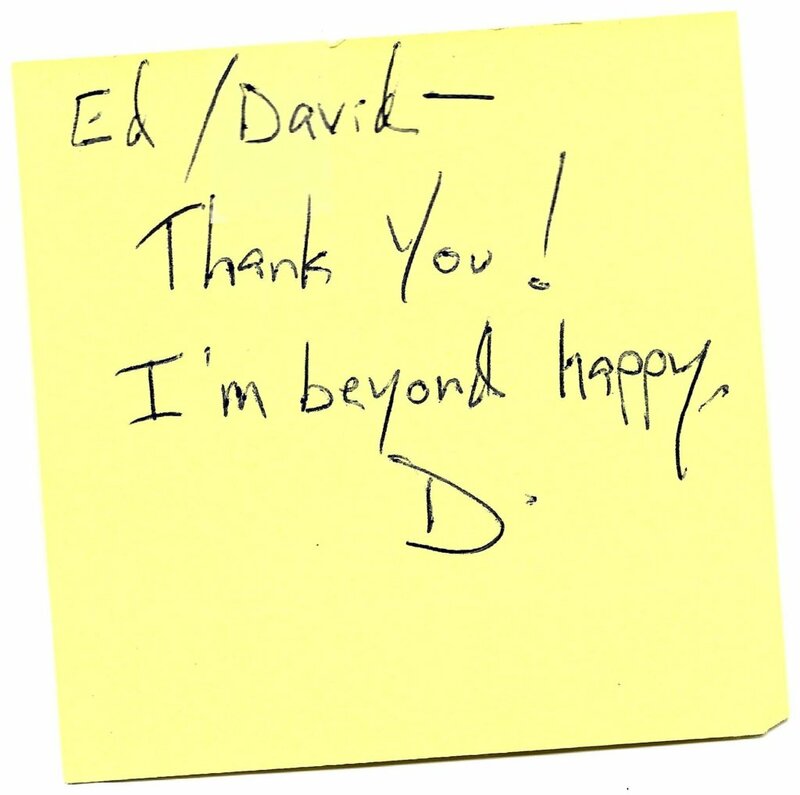 Mostly due to the fact that we had met with Ed on and off for about six months prior to our project starting, so we had a lot of time to get to know him and see first-hand how professional and personable he was when we met and in follow up emails. He also arranged for us to meet his partner before the job started and we’d be away. We did feel very secure while we were out of town and he would send us pictures from the job site everyday and take care of odds and ends for us in the house too. Collecting mail, packages, etc. The pictures each day was huge – we really liked knowing what was going on while we were out of town. We’re very pleased with the work Ed and his partner have completed on our kitchen – they have made the project as easy as possible for us to live through now that we’re back. He’s always very quick to respond to any questions we have and while the project is still on-going, we had no worries or doubts that it won’t be completed to our liking. Ed’s really a great guy and you don’t need to worry about him working on your home while you’re away. Ed repaired my cabinet and it looks amazing. It didn’t occur to me that he’d have to take the whole thing apart so I really appreciated his work. It was so small but in a rather obvious place and now the kitchen looks perfect. I simply could not be happier with the kitchen. My cabinets look FABULOUS! Ed is an artist with the paint brush. I didn’t realize how much of a difference the final touch-ups would make until I came home late afternoon and thought ‘Wow, something changed…this looks even better than before!’ Then I actually looked at the paint work and appreciated what it takes to get it truly right. I’m thrilled with the result. We are loving the handles and the pull-out shelves and drawers everywhere. Ed even replaced our faucet hose for free and what a convenience that was. Yea! What a satisfying project. Since we already knew each other, this was hardly a “blind date”. However, we had never engaged you to work for us so it was a new experience. I was comforted by your assurance that you would ‘hold our hand’ throughout the process, and direct us in the order of progression, time frames, sub-contracting, and the stores/showrooms that you had dealt favorably with for previous clients. And would be also be taking care of the planning permit and other city red tape. I loved that you said it didn’t phase you if we made changes to the plans even though work had already begun, that you were ‘adaptable’. It was very important to us to have someone (who would essentially be ‘living’ with us for almost 2 months) who had a great sense of humor, was easy going, and honest. You fit the bill – with bells on!! It has been a delight having you here. Your proposal seemed to us to be well laid out, clearly included all aspects of the work to be completed, and though we had no prior experience remodeling a kitchen, a reasonable bid. The fact that ALL the names you listed as references returned our calls with GLOWING reports was the icing on the cake! polite, competent, tidy and available either in person or by phone. I think the only minor setback was when Sears delivered a dented stove, but even that was replaced within 2 days. With the exception of the back-splash (which was delayed only by our own indecision) all work was completed in 6 weeks, start-to-finish! The plans drawn by Paul Price, of Novato Kitchens, were terrific and his help and expertise were also invaluable. The cabinets and counter top arrived on time and in good condition, as did our centerpiece sink!! We are truly delighted with the results. We will miss Ed being in our home, and suspect there will be more projects ahead so we can have him back! Now the hard part…how could you improve? Work for free? I’ll have to think about it, and get back to you at a later date. Thank you SO much for your guidance, attention to (sometimes tiny) detail and quality workmanship. We are very fortunate to have had you as our contractor for this major remodel and look forward to working with you in the future. You'll have my personal attention from estimate to completion And yes I work on the projects myself.